Robyn Maynard is a Toronto-based writer and the author of Policing Black Lives: State violence in Canada from slavery to the present. Her writing on race, gender, and discrimination is taught widely in universities across Canada and the United States. Desmond Cole Desmond Cole is an activist and freelance journalist in Toronto. His work has also appeared in the Toronto Star, Toronto Life, Walrus, VICE, NOW Magazine, Torontoist, and Ethnic Aisle. Desmond is currently working on his first book, on the experiences of Black Canadians. 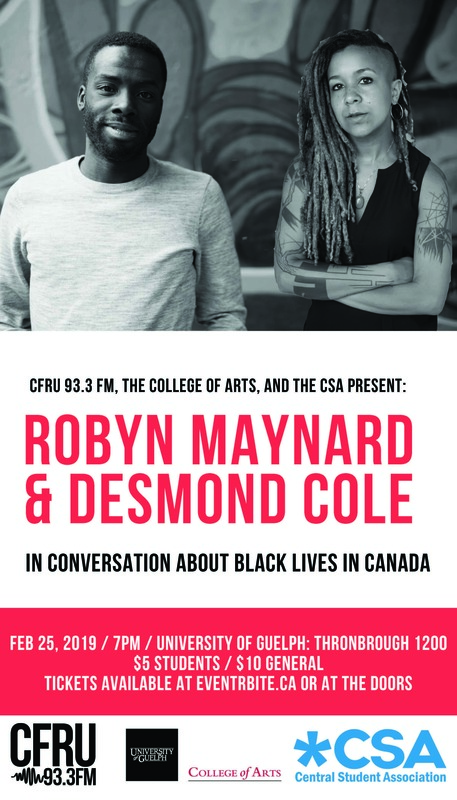 We are thrilled to bring these towering scholars to Guelph to engage in a rare conversation about the work that they do, and the experience of Black lives in Canada and the United States. Hosted by Cameron Litchmore and Amilah Baksh.